LONDON, ONTARIO, Sep 16, 2013 The Honourable Greg Rickford, Minister of State (Science and Technology), announced today the recipients of more than 760 grants to power new research initiatives-representing an investment by the Government of Canada of nearly $107 million in work being done at post secondary institutions right across Canada. "Our Government knows that investing in research creates jobs, strengthens Canada's knowledge economy, enhances our competitiveness, and improves the quality of life of Canadians," said Minister of State Rickford. "This is why Economic Action Plan 2013 is providing additional resources to support advanced research at universities and other leading research institutions. These resources will build on our Government's previous investments to strengthen Canada's research advantage and to better inform Canadians for their future." The funding is being delivered through the Social Sciences and Humanities Research Council of Canada (SSHRC). The federal funding will be invested in Insight Grants to support 461 initiatives carried out by individuals and small teams of researchers throughout Canada, and in SSHRC's Insight Development Grants to support 306 scholars in the early stages of their research . "This investment in social sciences and humanities research is a cornerstone to building Canada's capacity for innovation," said Chad Gaffield, President of SSHRC. "Through the Insight Grants and Insight Development Grants, we are supporting the highest levels of research excellence. This research will generate knowledge about the past and present that will lead to innovative solutions for today's most pressing social, cultural, technological, environmental and economic issues, and improve the lives of Canadians." Today's event at Western University highlighted the "Consumer Credit, Bankruptcy and Consumption over the Business Cycle" research initiative led by James MacGee, an associate professor in Western's department of economics. This project focuses on the effects of consumer debt on the Canadian economy. It will study the relationship between household consumption and consumer interest rates, household debt, and bankruptcies, providing policy-makers with tools to evaluate future risk, and helping both lenders and consumers make informed decisions about money, therefore better equipping Canadians with the resources to make more informed decisions about their future, so to secure their long-term prosperity. students (Jane Preston, University of Prince Edward Island). The 461 initiatives supported by these Insight Grants represent more than $88 million of the total investment. The 306 scholars supported by the Insight Development Grants will receive more than $18 million altogether. The complete lists of recipients are available on the SSHRC website. The Social Sciences and Humanities Research Council (SSHRC) is the federal agency that promotes and supports post secondary-based research and training in the humanities and social sciences. Through its programs, SSHRC works to develop talented leaders for all sectors of society, helps generate insights about people, ideas and behaviour and builds connections within and beyond academia that will build a better future for Canada and the world and help build understanding and knowledge to better equip Canadians make informed decisions about their future and long-term prosperity. 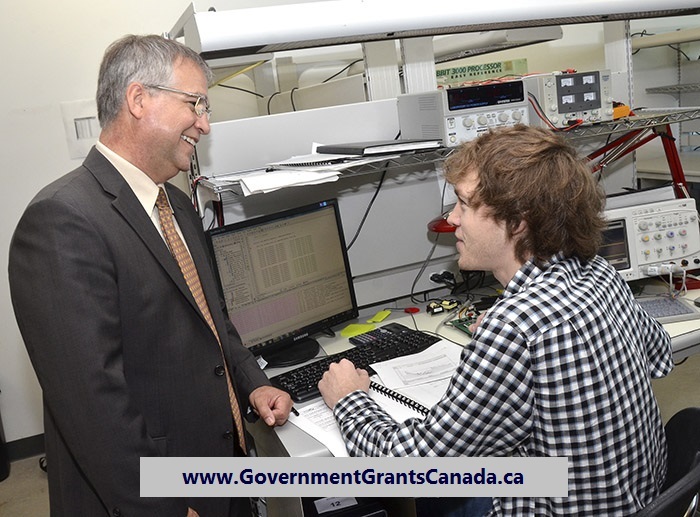 The Honourable Gary Goodyear, Minister of State (Science and Technology), today announced the Government of Canada's investment in 20 partnerships among colleges, universities and businesses through the College and Community Innovation (CCI) Program. The Minister made the announcement while visiting Conestoga College in Cambridge, Ontario. "Collaboration between college and university researchers and the private sector is vital to improving the quality of life of all Canadians, while building a strong economy," said Minister of State Goodyear. "The College and Community Innovation Program supports the deployment of the talent and knowledge developed in our post-secondary institutions while providing invaluable industry experience for students. This is win-win for all involved and our Government is proud to support these partnerships." In total, the Government of Canada will invest over $18 million in these new research partnerships. Conestoga College is receiving $515,000 over three years under a College-University Idea to Innovation grant to develop a portable device to detect the gold grade of mineral samples at mines and mineral exploration sites. It usually takes weeks or even months to ship mineral samples to labs for analysis and retrieve the results. This new gold detector will help speed up the process and increase production efficiencies of mining exploration companies. The college will collaborate with researchers at Laurentian University, as well as industrial partners Barrick Gold Corporation and Kendall Technology. These investments provide businesses with access to the people, resources, and tools at Canada's colleges that companies need to be at the forefront of innovation," said Janet Walden, Chief Operating Officer of the Natural Sciences and Engineering Research Council of Canada (NSERC). "The ultimate goal is to create sustainable partnerships that will help sharpen our innovative edge and have a positive impact on the bottom lines for industry and our country." The CCI Program is managed by NSERC, in collaboration with the Canadian Institutes of Health Research (CIHR), and the Social Sciences and Humanities Research Council of Canada (SSHRC). Since 2006, the Government of Canada has provided more than $9 billion in new funding for initiatives to support science, technology, and the growth of innovative firms. Economic Action Plan 2013 builds on this strong foundation, helping to position Canada for sustainable, long-term economic prosperity and a higher quality of life for Canadians. For more information and the full list of recipients, please visit the NSERC Web site. Seniors in Manitoba will benefit from over $104,000 in federal funding which will facilitate physical and recreational activities, increase seniors' social participation and raise awareness of seniors' issues. The Honourable Vic Toews, Minister Responsible for Manitoba and Member of Parliament for Provencher, made the announcement today at the Brooklands Pioneer Senior Citizens Club on behalf of the Honourable Alice Wong, Minister of State (Seniors). "The Government of Canada recognizes the important role that seniors have played in building our great country," said Minister Toews. "We're helping to ensure that seniors remain active in their communities and can continue to contribute their skills, knowledge and experience." Through the New Horizons for Seniors Program (NHSP), the Brooklands Pioneer Senior Citizens Club is receiving $17,500 to offer computer lessons, organize social outings and set up a reading program bringing together seniors and elementary school students. The NHSP is also supporting five other seniors' organizations based in Winnipeg. "We would like to thank the Government of Canada for its support and funding," said Alice Steinke, President of the Brooklands Pioneer Senior Citizens Club Inc. "This funding will support the social participation and inclusion of seniors by providing a reading program between seniors and students, computer courses and planned outings." The NHSP supports projects led or inspired by seniors who want to make a difference in the lives of others and in their communities. The Government of Canada is investing more than $33 million in support of over 1 750 projects that will lead to programs and activities for seniors across Canada. The 2013-2014 Call for Proposals for community-based projects was launched on May 22, 2013. For more information, visit hrsdc.gc.ca/seniors. The Government of Canada announced funding to help a recent graduate in North Bay to gain the skills, knowledge and experience needed to enter and succeed in the job market. The announcement was made by Jay Aspin, Member of Parliament for Nipissing-Timiskaming, on behalf of the Honourable Diane Finley, Minister of Human Resources and Skills Development. "Our government's top priorities are creating jobs, economic growth and long-term prosperity," said Mr. Aspin. "The Government of Canada's Youth Employment Strategy is helping youth develop the skills and gain the experience they need to get jobs now and prepare for the workforce of tomorrow." The Capitol Centre is receiving over $19,000 from the Career Focus program to help a recent graduate gain on-the-job experience and apply the skills acquired through education to ease the transition to work. Career Focus is part of the Government of Canada's Youth Employment Strategy (YES). The graduate will gain career-related experience in history, heritage and the arts by working as a heritage coordinator over a 10-month period. The participant will perform various duties such as supervising and recruiting volunteers, organizing and conducting tours, as well as writing and executing a marketing campaign. "The Capitol Centre is delighted to receive Government of Canada funding to provide career-related work experience," says Dee Adrian, General Manager, Capitol Centre. With annual funding of approximately $300 million, YES helps youth, particularly those facing barriers to employment, obtain career information, develop skills, find jobs and stay employed. YES includes the Skills Link and Career Focus programs and the Canada Summer Jobs initiative, which creates thousands of job opportunities for students every summer. Economic Action Plan 2013 proposes an additional investment of $70 million over three years to create 5 000 more paid internships. This is further to the extra $50 million invested through Economic Action Plan 2012 to enhance YES with a new initiative that connects young Canadians with jobs in high demand and helps them develop tangible skills and gain work experience. Youth employment programs are part of the Government of Canada's broader strategy to connect Canadians with available jobs. Economic Action Plan 2013 proposes new measures to equip Canadians with the skills and training they need. These include the Canada Job Grant, creating opportunities for apprentices and providing support to under-represented groups such as people with disabilities, Aboriginal peoples, newcomers and youth. To learn more about Canada's Economic Action Plan, visit actionplan.gc.ca. Skills Link, which is part of YES, helps youth facing barriers to employment, including youth who are single parents, youth with disabilities, young newcomers and youth in rural and remote areas, to develop the skills and gain the experience needed to find a job or the confidence to return to school.